Browse through a selection of original Freeman Brochures, starting with the very first Freeman 22 Mk1 'Sports Cruiser', the Freeman 22 Mk2, Freeman 26 and the Freeman 33 Sport boats. We will be adding to the brochures available on a regular basis. 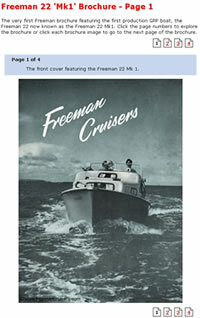 The very first Freeman brochure featuring the first production GRP boat, the Freeman 22 now known as the Freeman 22 Mk1. An early brochure featuring the Freeman 22 'Mk2' and the Freeman 26 cruisers. A later version of the Freeman brochure featuring the Freeman 33 Sport in the style of the boats themselves. How do I view the brochures? The Freeman brochures are displayed one page at a time. You can browse through each brochure using the page numbers displayed at the top and bottom of each page or you can view the next page by clicking on the image. The brochures are provided on this website for personal use only, the brochures and images shall not to be reproduced without prior permission. All copyrights and trademarks are the intellectual property of John Freeman (Sales) Ltd. Printed higher quality versions will be available from the Freeman Shop shortly. Higher resolution images are available for publishing on request.